While the Bulldog may bode a very stern appearance and attitude, it has a very comical demeanor which most do not expect. They enjoy listening to their owners and adore being around little ones. The Bulldog is adaptable when engaging with other pets and they can be reserved but still remain friendly any time strangers enter their home. They can be stubborn at times, but overall are canines that are people pleasers. A Bulldog is not a very energetic animal and they also can be rather playful. The Bulldog is a dog that will happily engage in a daily walk, but they generally do not require very much physical activity. They are not the type of canine that can comfortably reside outdoors in warmer climates and they are also not known for any swimming capabilities. Their fur coat is easy to care for and does not require a good bit of maintenance, generally a brushing on a weekly basis will be suffice. Bulldog's are not terrific watchdogs and do not offer protection in most cases if you are seeking a dog for security purposes. Major health concerns for the Bulldog are ventricular septal defect, CHD, KCS, shoulder luxation and stenotic nares. They also have been noted to experience an internalized tail and an elongated soft palate as well. Some minor issues they can develop are cherry eye, patellar luxation, entropion, elbow dysplasia, demodicosis, ectropion and distichiasis. In rare occurrences, the Bulldog can also develop vaginal hyperplasia in females and urethral prolapse. The vet may recommend screening for the dog as they progress in age for their eyesight, hips, knees and elbows. 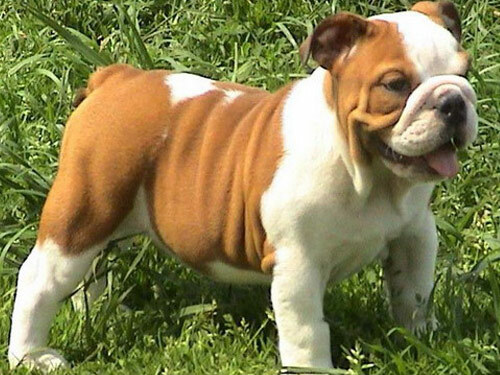 Due to their folded skin, the Bulldog can commonly develop skin dermatitis. Experts will recommend the owners try to keep those wrinkles and folds in the dog's skin clean and free of moisture. The average lifespan for a Bulldog is from eight to twelve years long. With an weight of forty to fifty pounds as a full grown dog. With their signature facial expressions, the Bulldog is one of the most recognizable dogs in the world. Their previous main responsibility was to guard and even attack bulls, giving them their name as well as their claim to fame in England. Back in the early 13th century, this form of bull hunting was well known for entertainment purposes and many in the local communities would gather round to watch the Bulldogs taught and hunt the bulls. Once the late 1800's came about, the actual sport of bull baiting was no longer permitted. They are also still currently associated with England as a very popular symbol of their culture. You can view Bulldog references all over the towns in England and they are an extremely popular house pet in the UK and America as well. It appears that once the reputation was spread that in fact the Bulldog was not as cruel or stern in personality as their reputation was given, they became a staple of being one of the most common canine companions.